The tail boom could carry 36 passengers, as many as a lot of passenger aircraft of the day. ABOVE LEFT: Looking aft in the Boom. Paratroop seats are along the sides. 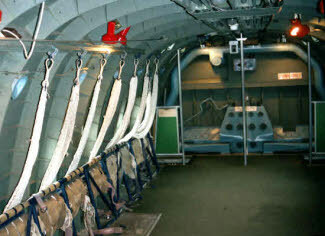 30 paratroops could be carried in the Boom with 40 more in the Freight Bay. 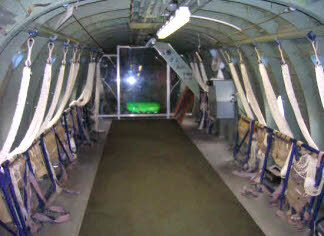 A perspex shield at the far end prevents visitors from falling through the paratroop exit. The paratroop doors are open as part of a display. ABOVE RIGHT: Looking forward in the Boom. The green panels are where the ladders up from the Freight Bay are positioned. 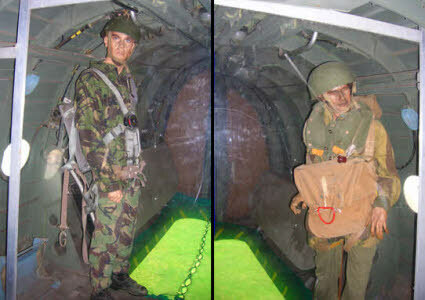 LEFT: Mannequins of paratroops on each side of the paratroop doors. In reality the paratroops would form up in single file facing the doors, ad drop through one at a time in rapid succession. 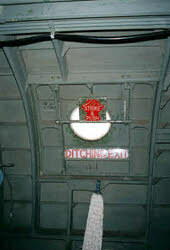 The RAF Paratroop Despatcher controlling the exit would be to the side of the Boom. The green tinge in the door is a perspex shield fitted to the floor. ABOVE LEFT: Front fixing for the parachute static line cable. ABOVE RIGHT:The flap actuating motor (bottom left), and the handle for manual lowering of the flaps in case of motor failure. LEFT: The starboard of the two ditching exits at the front of the Boom. 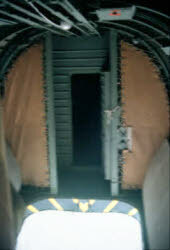 RIGHT: The entrance to the toilet beyond open parachute doors. LEFT: A panel for an intercom headset on the starboard side of the Boom at the front. I spent many an hour connected to one of these on the way to and from dropping zones.